Communicate with up to 1023 CNC machine tools simultaneously from a single computer. Interact with the communications server directly from your CNC controller. Download, Upload, & Drip-Feed NC/Files from the CNC Controller, or any computer on your network. Add Reliability to your classic RS-232 serial connections. Remove long runs of RS-232 cable and replace them with digital wireless TCP/IP connections. Move your CNC tools and never run RS-232 cables again! True 32 Bit Editor and Back-Plotter provides comprehensive, fast and detailed wire-frame verification of G-Code. User friendly and fast editing makes working with code an ease! A comprehensive Communications and Data Collections package, for A.B.C. (Activity Based Cost Systems) in today's manufacturing. The eXtremeMFG suite provides detailed yet easy to understand data for the evolving processes of J.I.T. (just in time) manufacturing and Cost Drivers for budgeting allocation. 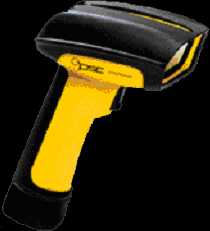 PowerScan™ Industrial Handheld Bar Code Scanner. Effortless downloading of NC/files from you CNC controller. Stop typing NC/file names in difficult to use controllers. Scan, then receive your NC/file names with an industrial strength Bar-Code Scanner. You can rely on the PowerScan scanner for fast, accurate bar code reading, from up close to over 65" (165cm) away. Send mail to webmaster@ascendtec.com with questions or comments about this web site.